(updated April 25, 2016) As my regular readers know, I’m not just the Trade Show Guru, I’m the frugal Trade Show Guru. You can easily waste a lot of money on trade show marketing if you don’t know what you’re doing, which is why I write not just about trade show marketing in general, but also how to stretch and maximize your limited marketing budget dollars. To be perfectly honest, I’m also just plain cheap frugal (except when it comes to beer, and a few other necessities of life). I don’t like to waste money or overpay, nor do I like to get taken advantage of or be ripped off… but that’s really just what my old cell phone providers did to me for many years. On this blog, when I find ways to save money, and/or come across innovative companies that have a better way of doing things, I let my readers know. One innovative, paradigm-shifting company like that is Republic Wireless, a relatively new cell phone service provider. I heard about them over a year ago when I was looking for a better deal on cell service, but it wasn’t until this past summer that I decided to try them out. Being cautious by nature, I signed up for one phone with them in June (2014) to test things out. I was so pleased with the phone and the service that we got two more phones in July and August, and dropped our old service with T-Mobile. What follows is my review of Republic Wireless after being with them for a year and a half (as of February 2016), and why you should consider switching to them. Republic Wireless is a new cell phone provider that has only been around for a few years, but based on my own experience with them, I think they’ll be around for quite a while. Their parent company, Bandwidth, has been around for quite a while and is a major behind-the-scenes player in the phone industry. What makes Republic wireless unique (or made them unique until T-Mobile recently started copying them) is that they developed a cell phone that also works over a wireless internet connection (using voip – voice over internet). T-Mobile is now copying them, but Republic Wireless was the first to develop the idea and technology, and more importantly, their system works. Republic Wireless uses Sprint (and Verizon roaming) to provide the cell service for the cellular side of their service (when you don’t have access to wireless), but if you have wireless internet access, you can talk, text, and download and surf the internet as much as you want. No limits at all. They’ve also got an amazing set of price plan options. For $5 a month, your phone works when you have wireless internet access. You get UNLIMITED talk, text, and data (over the internet), but no cellular service. For $10 a month, you get unlimited talk, text, and data (internet) via wifi, and you get unlimited talk and text via the Sprint network (and roaming on Verizon) when you don’t have wifi access. You don’t get any cellular data, and need wifi to access the internet. 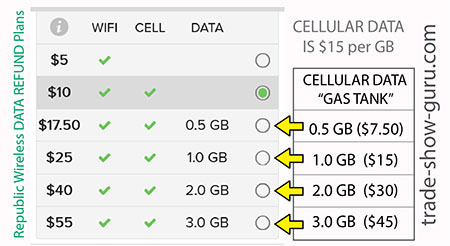 The easiest way to understand the new Republic Wireless Data Refund plans is to view them as adding a “cellular data gas tank” to your phone. In the beginning, you pay to fill up your data gas tank. Then each month your tank gets topped off, but because you get a refund/credit for the data you didn’t use, you are only paying for the data to “top off” your data gas tank. If you only use 0.3 GB of data one month, the next month you only pay for 0.3 GB ($15x.3 = $4.50) to refill your data tank. In addition, if your tank isn’t big enough and you run out of data during the month, you can buy another GB of data to put in your tank, and you’ll get a credit for any that you don’t use (what ever is left over) at the end of the month. You can select any plan (i.e. any size gas tank), but you’ll only end up paying for the data you use. Thus, with any of the Data Refund plans, your monthly bill is only $10 plus whatever cellular data you actually use (at $15 per GB). Keep in mind if you only use wifi data and don’t use any cellular data, you don’t have to pay for any cellular data, and your monthly bill is just $10! About half of Republic Wireless’s customers who have a cellular data plan use about 0.3 GB of cellular data each month, so their monthly bill is about $14.50 ($10 plus $4.50 (.3 x $15)). On the $17.50 data refund plan, you get the $10 monthly plan PLUS 0.5 GB of 4G cellular Sprint data (the data you don’t use is refunded at the end of the month and the credit is applied to your next bill). Your actual monthly cost depends on how much cellular data you use. On the $25 data refund plan, you get the $10 monthly plan PLUS 1.0 GB of 4G cellular Sprint data (the data you don’t use is refunded at the end of the month and the credit is applied to your next bill). Your actual monthly cost depends on how much cellular data you use. On the $40 data refund plan, you get the $10 monthly plan PLUS 2.0 GB of 4G cellular Sprint data (the data you don’t use is refunded at the end of the month and the credit is applied to your next bill). Your actual monthly cost depends on how much cellular data you use. On the $55 data refund plan, you get the $10 monthly plan PLUS 3.0 GB of 4G cellular Sprint data (the data you don’t use is refunded at the end of the month and the credit is applied to your next bill). Your actual monthly cost depends on how much cellular data you use. In addition to the above data refund plans, you can always buy chunks of cellular data when you need them (0.5 GB of cellular data for $7.50 or 1.0 GB of cellular data for $15), and you’ll be refunded at the end of the month for the unused portion. That is, you can either go with a Data Refund plan above and have a “data gas tank” OR you can just add some “gas” (cellular data) when you need it. Either way, you only pay for the “gas” (cellular data) that you use. You don’t have to worry about running out, because you can always buy more “gas” (cellular data). You don’t get charged a penalty or have to pay a higher rate if you run over or run out. Anytime you want, you can buy “gas” (cellular data) and it’s always the same price, whether you keep it in your “data gas tank” or just buy it when you need it. To decide if Republic Wireless is right for you, you should determine how much cellular data on average that you need each month. Remember that anytime you’re around wifi, all your data is FREE. If you look at your past cell phone history, you should be able to determine how much total data you actually use and how much of it is cellular data. If you use almost no cellular data, your monthly bill would be just a little over $10. If you use about 1.0 GB of cellular data, your monthly bill would be about $25. If you use about 2.0 GB of cellular data, your monthly bill would be about $40. If you need more cellular data than that, you might want to consider another cellular provider besides Republic Wireless. But a nice feature of Republic is that with their app you can turn cellular data on and off (by application or for the whole phone), so you control how much data is used. And you control how much you buy. There are no penalties or overage charges. You just buy the data as you need it, and you get refunded if you don’t use it. So you can buy more than you think you need, and then not lose all the money you spent. As a point of reference on how much cellular data you might need and how much Republic Wireless service might cost you each month, in August 2015, the average Republic Wireless customer on a Republic Refund data plan used .25 GB of cellular data and ended up (after the refund) paying $13.82 for the month (plus tax). I think that’s unheard of for a smart phone service plan with cellular data, but saving this much money is possible if you have unlimited wifi data, you’re careful with how much cellular data you use, and you get paid back (refunded) for the cellular data you don’t need or use. For smart phone users who are around wifi most of the time and who don’t need a lot of cellular data, Republic Wireless can save you serious money! My family and I can live without cellular data, so we use the $10/month plan. We have wireless at home, work, school, and most places we shop (and we can live while driving without steaming Youtube or checking the latest Kim Kardashian gossip updates on Yahoo). For us, the $10 a month plan just cannot be beat. Period. If you’re a little less frugal than me, or if you need cellular data, you can go with one of the new Republic Refund cellular data plans and pay a bit more. I was paying T-Mobile about $72 a month for two flip-phone (one for me, one for my wife) with limited talk and text (yes, I can be a bit of a techno-luddite and didn’t get a smart phone until last year… sometimes I resist change). I was pretty sure I was overpaying for what I was getting from T-Mobile, but I didn’t want to fork out a small fortune for a smart phone I thought I didn’t really need, and then pay an arm and a leg every month for cellular data that I also didn’t really think I needed. I grumbled and occasionally fumed, and we lived with our two old school flip phones. My two kids hung their heads in shame when we’d pull out the flip phones in public, but such was life. When we decided it was time to get my daughter her own cell phone, I was open to trying something new and decided to give Republic Wireless a whirl. Their $10/month plan for unlimited talk and text was just what we needed (we correctly anticipated our daughter would text A LOT), and they offered the Motorola G smart phone for only $150. I was much more comfortable trusting a twelve year old kid with a $150 Moto G (Gen 1) instead of a $600 iPhone. As I wrote above, after trying them out, the Moto G and Republic Wireless were everything we hoped for, and we then got two more Moto G smart phones for my wife and myself. We now pay $30 a month ($32.63 including taxes) for three smart phones with unlimited talk and text, and unlimited free internet over wifi. 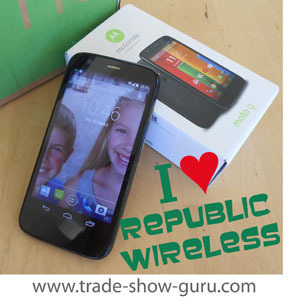 The great thing about Republic Wireless is how much money you can save! We added a third phone and still cut our cell phone bill more than in half ($72 to $32), and now have better phones with better service and more options. If you sign up with Republic Wireless, you will need to purchase a phone from them because they have special firmware in their phones that allow their phones to work on wifi. You can’t bring or use your own phone. But the good news is that Republic Wireless phones aren’t that expensive, especially compared to Apple iPhones, and by buying the phone outright you don’t get locked into a 2 year contract or inflated monthly payments. Unlike other cell phone providers, Republic Wireless doesn’t sell a subsidized phone with monthly payments that lock you into an overpriced two year contract. With Republic, there is no contract. Republic Wireless currently offers two smart phones: the “entry level” 2nd generation Moto E for $129 and the “midrange” 3rd generation Moto G for $199 (now $179!). Their “higher end” 2nd generation Moto X for $249 is no longer available as it is no longer made by Motorola, but they are expected to introduce a new higher end phone (maybe the Moto X 3rd gen?) in the spring of 2016. Both the Moto E and the Moto G are amazing values and both work well. I’ve summarized their features below. 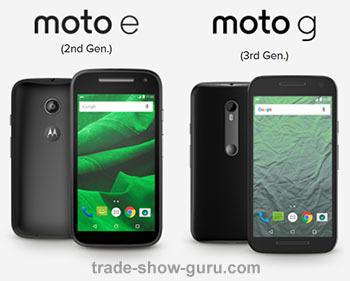 The “midrange” 3rd generation Moto G is my personal favorite and what I would get if I was replacing one of our 1st generation Moto G phones, but the Moto E is a fine choice if you just want a basic but useful smart phone and you’ve got a tight budget or you don’t need the better phone camera or higher resolution screen. If you want to go all out, you can get the higher-end 2nd generation Moto X (no longer available but will probably be replaced soon with a newer generation model). Republic Wireless doesn’t offer iPhones or any other phones, but their Moto lineup should meet the needs of most people. > overall, a great basic smart phone and an incredible value. Note there is no flash for the main camera. > waterproof! this phone was rigorously tested and certified to be immersed under 3 feet of water for 30 minutes and still work (but don’t attempt to use it under water). The days of spilled-soda or toilet-dunk destroyed smart phones are over! > my favorite phone. We continue to be very happy with our original 1st generation Moto G smart phones, which were called a “game-changer” by many reviewers. This new 3rd generation Moto G continues to get very high reviews. It improves on the original with a better camera, better battery, 4G cellular data speeds (if needed), and several other improvements, among them that the new Moto G is waterproof! If you can afford it, I recommend the 3rd Generation Moto G, though there is nothing wrong with the Moto E if that’s all you need. Compared to our old 1st generation Moto G smart phones, the new (3rd generation) Moto G has a better camera, a better battery, and one can add up to a 32GB to expand the memory (for holding more photos, videos, songs, etc). And the new Moto G is water-proof! Amazing! 2. Republic Wireless uses the Sprint network for their cell service. You will want to check your zip code and make sure you have Sprint coverage at home and at work, as well as throughout your community. You can check your local Republic Wireless / Sprint cellular coverage map here. 3. If you don’t have wireless internet at home and work, then I wouldn’t recommend Republic Wireless. The great thing about Republic Wireless is that their phones work over wireless to provide excellent call quality, and unlimited internet access. 4. You have to buy a phone from Republic Wireless. The phone will only work on Republic Wireless. If you leave Republic Wireless, the phone won’t work with any other carrier. But… you can still use it to connect to the internet and run apps, and actually, with a free Google voice number, you can even use it as an internet phone (only when you have wireless). 5. Republic Wireless doesn’t offer local phone numbers everywhere in the US (but they’re getting there), and you may not be able to port your existing local number over. When we signed up with Republic, we weren’t able to get a local Santa Barbara phone number. We did get the proper area code, but the closest available number was an Ojai number (a community that is 30 miles away). And because Republic Wireless didn’t have local numbers available, we also weren’t able to port our old Santa Barbara numbers over and thus had to change our numbers. But as I said, Republic Wireless is the kind of company that keeps working on issues and getting better, and now they do have Santa Barbara numbers available. You can see if they have a local number for your community, and more importantly, if you’ll be able to port your existing number over to Republic. If not (which I think is fairly rare), you’ll end up loosing your old local number and you’ll need to let people know you have a new number. 6. Customer Service – Republic Wireless doesn’t have a phone number you can call to talk to someone. Instead, you can submit a support ticket and someone will get back to you. They recently introduced a live chat system during normal business hours, but I haven’t tried it. They also have a community forum that you can ask questions on, which seems to be both quite active and quite helpful. I personally don’t mind not being able to call customer support. When I was with AT&T and T-Mobile, I called customer support several times and often had to navigate through a confusing prompt system, only to be put on hold for too long, and then finally get a very nice person that couldn’t really help me but would make lots of promises that would never seem to pan out. So with Republic Wireless, I don’t mind submitting a help ticket or asking a question on the community forum, but for people that want to be able to call customer support (and then wait indefinitely on hold only to get a human who’s only skill set seems to be giving you the run-around), Republic Wireless may not be for you. 7. Cell phone voice quality… these are cell phones, and sometimes sound like… cell phones. I’m actually amazed by how clear the voice quality usually is on wifi, and often is on cell. But sometimes the call quality is a bit garbled, or rarely the call drops or I have to call twice. But since I had the exact same experience with every cell phone I have ever had, this doesn’t bother me. But if cell phones bother you, then these cell phone may bother you too (but less because usually wifi call quality is amazingly good). Since the Trade Show Guru is all about trade show marketing, and marketing in general, I feel I must mention that Republic Wireless is an example of a company that uses smart marketing. You probably haven’t heard of them because they don’t spend millions on television commercials. They aren’t like Sprint which has people cutting paper cell phone bills in half with chainsaws and weed-wackers. They aren’t like T-Mobile which has hipsters jumping around filmed in black and white with splashes of pink. And they aren’t like AT&T which had amazingly cute commercials of a man sitting a little table with little kids asking them questions and getting the kind of answers that only little kids could come up with. No, Republic Wireless doesn’t spend their money on cute, hip, national TV commercials trying to convince you they are the best cell phone provider. Instead they spend their money on actually innovating and improving their product to actually be the best cell phone provider. Action, not words. And as a result, Republic Wireless ends up with happy customers like me who can’t stop gushing about how great Republic Wireless is. That’s what smart marketing is all about. If you want to save money and lower your smart phone / cell phone bill, give Republic Wireless a try. They have a 30 day money back guarantee. You can try the phone and service for up to 30 days, and if you aren’t happy with it, you can send the phone back for a full refund (minus shipping, and assuming the phone is still in excellent condition, otherwise they may deduct for damage to the phone). As I see it, you’ve got nothing to lose, and lots of money to save. Besides the obvious cost savings, there is something to be said for WiFi calling. Was in the basement of a major hospital in Grand Rapids MI. (radiology dept) with a friend who had a seriously sick child. No one there had cell phone service from any carrier and we really needed to make calls. I hooked up to the hospitals WiFi and instantly had perfectly clear calls. Thanks Republic Wireless sometimes you are truly a lifesaver.